As it turned out, Dayna had just launched her blog at the same time I had just begun creating mine. I was so surprised/flattered/honored and excited when The Dayna of Dayna Lee Collection asked me to be her first "inspirational woman" for her blog. It was so awesome and encouraging that someone who has more followers/more etsy sales than I do, would decide on a less known artist to feature. I mean, she could have featured a better known artist that could help her gain more notoriety but she chose to help out a fellow upcoming lady boss. How cool is that? When I heard my first periscope by business guru @cyndiespiegel , it immediately made me think of Dayna. Although Dayna hadn't heard the scope (because it happened after she had featured me), she was already, perhaps unknowingly, building the lady tribe discussed in Spiegel's scope when she reached out to me. Spiegel encouraged listeners to not view others as our "competitors" but more as potential members of our "lady tribe." Although there will always be other artists, jewelry makers, teachers, lawyers, etc, there isn't another YOU. Since no one does exactly what you do, how you do it, for the same reasons, we should not fear others that do similar things but should instead, befriend them. She challenged us to reach out to someone that does something similar to us, who others may view as a "competitor" and get to know them/invite them into our lady tribe. Your lady tribe will be there when you need last minute advice about your popup show, when something with a customer goes horribly wrong or to celebrate your latest creative endeavor, in a way that other friends may not understand. The timing of the scope was so serendipitous, as Dayna and I had just begun our collaboration for two free prints to give to subscribers of our new blogs. I love the juxtaposition of Dayna's powerful messages illustrated in such a beautiful and fun way. You'd have to ask her, but I read it as Dayna (maybe even subconsciously) saying that you don't have to pick being "strong" or being "girly." 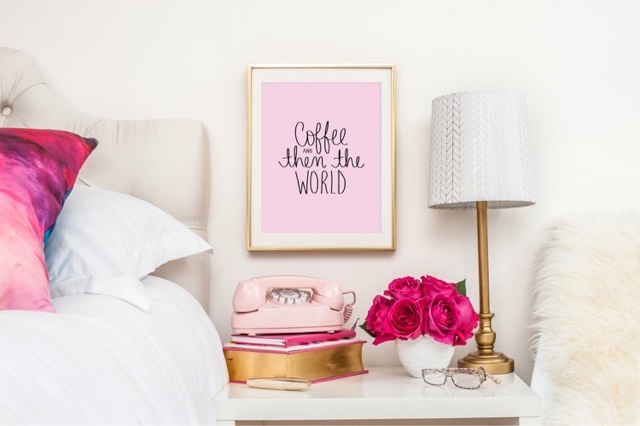 Life is not in black and white--if you want to live in shades of pink, go girl! It has been such a pleasure working with, and getting to know, Dayna in recent months. Although her story is full of surprises (for example, besides running an empire, she is also a mother of 3!) 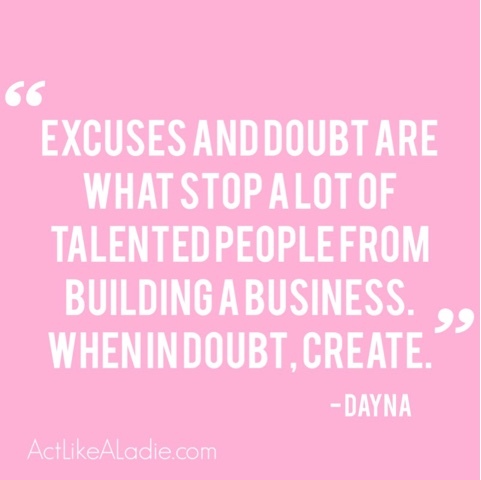 when you pull back the curtain on Dayna Lee, unlike in the wizard of Oz, she is every bit the inspirational female entrepreneur as the upbeat words in her art. So without further ado, I'd like to introduce the girl boss herself, Dayna Langlois of the Dayna Lee Collection. 1. Who is Dayna Lee? How’d you come up with your business name? I’m a 28 year old busy mom to three children, including a newborn. I am the designer/owner of Dayna Lee Collection, a brand based upon the foundation of empowering women through hand lettered inspirational goods. There is no real story behind my business name. It started as DL Paper Goods and Home Accessories I do believe. Clearly, way too long. I then found an inspirational career profile on a woman who ran a successful stationery business and was a mother of three. Not only did her story stand out to me but also the fact that her business name ended in “collection”. I thought it was so sophisticated and truly allows a business to be much more than one product. I didn’t know what I was doing back then or what I wanted, but now… I do have that collection of offerings and love how everything unfolded. 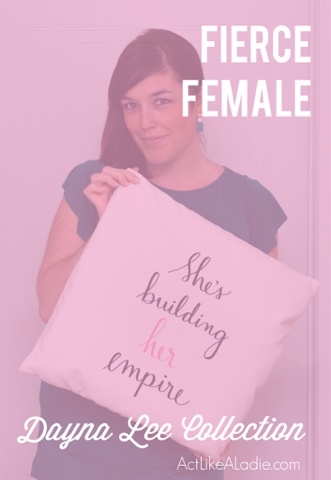 I found it important to have my name in my business as well so I combined my first and middle name so that I would always work hard to build something amazing… because my name was on it. 2. Are you a full time Maker/Artist? If so, how did you make that transition? Right from the start, I left my part-time job of working at a popular coffee shop to dive into something full-time. I knew that it would take a while to build a business and earn an income so ever since I started my business in March of 2014, I have been pursuing it on a full-time basis. I didn’t have a skill set or a strategy so a lot of my hours went into just finding myself through my business. 3. How do you balance your business and being a mom of three? To be honest, I haven’t quite figured this out yet. My third baby is only two months old and I’m feeling very overwhelmed with the growing business and my growing family. I’m at the point where I think I need to let go of wanting to control all aspects of my business and know that it would be beneficial to bring in extra help. While it is hard for me to accept, I know I cannot do everything. “You can do anything, but not everything” as they say! 4. What is the best part of your job? And what is the toughest part of it? My favorite part of my job is when someone just gets me. When a woman gets every quote, relates to the words and loves my designs - I’m on cloud nine! I think, wow! This woman is excited about what I’ve created, quotes I’ve written, and colors I’ve chosen. That is huge! The toughest part if having to deal with things out of my comfort zone. The big one is having to be assertive with getting what I want and need especially when it comes to speaking up with manufacturers. 5. I love how in describing your journey you say that you started to write what you needed to hear. What is the best advice you have for budding artists/makers/entrepreneurs? In the beginning, you may be scared and unsure. Not only unsure of what you’re doing, but also of yourself. Use these feelings to your advantage. Get out of that comfort zone and just start doing things you’re not ready for, say yes and figure things out along the way. Most importantly, prove to YOURSELF that you can handle each thing along the way and your confidence and skill set will only grow! 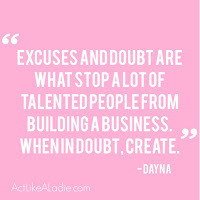 Excuses and doubt are what stop a lot of talented people from building a business. When in doubt, create. 6. What is something that we don’t know about you? I have literally no experience or schooling in design. I don’t know how to use Photoshop or Illustrator and I don’t know proper calligraphy. I’m just a girl with pretty hand lettering with a strong desire to change her life! 7. Where do you see your empire going? ie what does the future hold for the Dayna Lee Collection? I’m truly ready to take Dayna Lee Collection to a whole new level! I’m working on more product lines, more collaborations, and bigger moments. I’m revamping my shop and the hustle is on! I have a huge show coming up in 2016 and many plans to expand. Stay tuned!